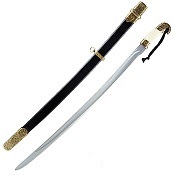 This classic 19th century cavalry saber was a favorite of the feared Russian Cossacks for decades. This sleek and ornate replica features antiqued brass engraved furniture, simulated ivory handle and 35" blade. Features, Overall Length: 35". Blade: 30"